Mongolian cuisine is much influenced by the continental climate that dominates the region, and also a bit by the Russian and Chinese cultures. Meat and dairy form the staple diet of this nomadic cuisine, with the use of vegetables being limited. The meat of horse, yak, beef, lamb and even camel is consumed as delicacies. 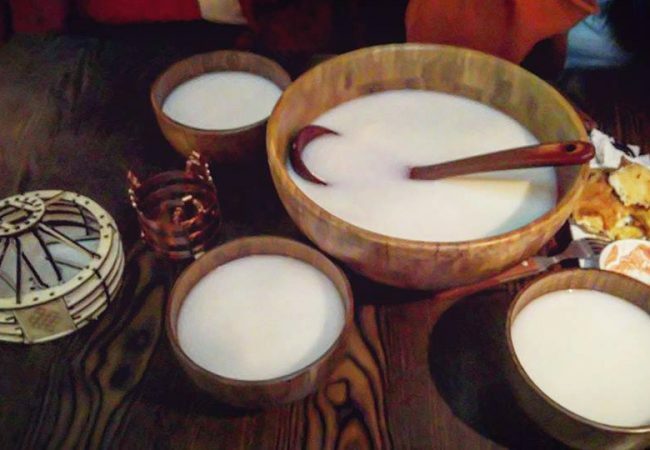 Airag is the traditional national beverage of Mongolia. The most important animal of the Mongols is the horse. Horses don’t only serve as riding animals, the mare’s milk also has a special status. Airag refreshens and sparkles softly on the tongue. It contains a small amount of carbon dioxide, and up to 2% of alcohol. The taste is slightly sour, but quite agreeable after getting used to it. The exact taste depends both of the characteristics of the pastures and the exact method of production. The beverage is a rich source of vitamins and minerals for the nomads. 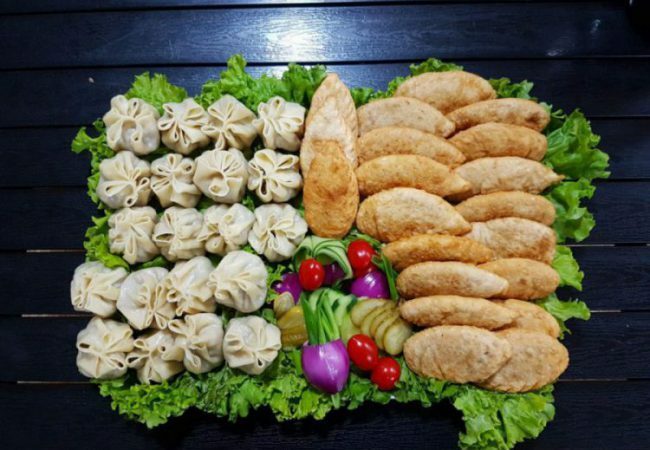 Khuushuur is a kind of meat pastry or dumpling popular in Mongolia, similar to Russian and other cuisines’ chiburekki. The meat, either beef or mutton, is ground up and mixed with onion (or garlic), salt and other spices. The cook rolls the dough into circles, then places the meat inside the dough and folds the dough in half, creating a flat half-circular pocket. The cook then closes the pockets by pressing the edges together. A variety of Khuushuur has a round shape made by pressing the dough and mince together using the dough roller. After making the pockets, the cook fries them in oil until the dough turns a golden brown. The Khuushuur is then served hot, and can be eaten by hand. At the Naadam Festival in Ulan Bator, there were a large number of stalls selling freshly made khuusuur which were snapped up in high numbers by locals gathering to watch the games. To make khorkhog, Mongolians take lamb (goat meat can be substituted) and cut it into pieces of convenient size, leaving the bone. Then the cook puts ten to twenty fist-sized rocks in a fire. When the rocks are hot enough, the rocks and the meat are placed in the chosen cooking container. Metal milk jugs are a traditional choice, although any container sturdy enough to hold the hot rocks will serve. The cook adds other ingredients as desired (carrots, cabbage, potatoes) to make a stew, then adds salt and other spices. The ingredients should be layered, with the vegetables on top. Finally the cook pours in a sufficient quantity of water to create a steam bubble inside the jug, which he then closes with a lid. The heat of the stones and the steam will cook the meat inside the jug. The cook can also put the jug on a fire or the stove if the stones are not hot enough. The stones will turn black from the heat and the fat they absorb from the lamb. The jug should remain covered while the cook listens to and smells the meal to judge when it is ready. The stones can take up to an hour and a half to cook the meat sufficiently. When finished, the khorkhog is ready to eat. The cook hands out portions of meat along with the hot stones which are tossed from hand to hand and are said to have beneficial properties. 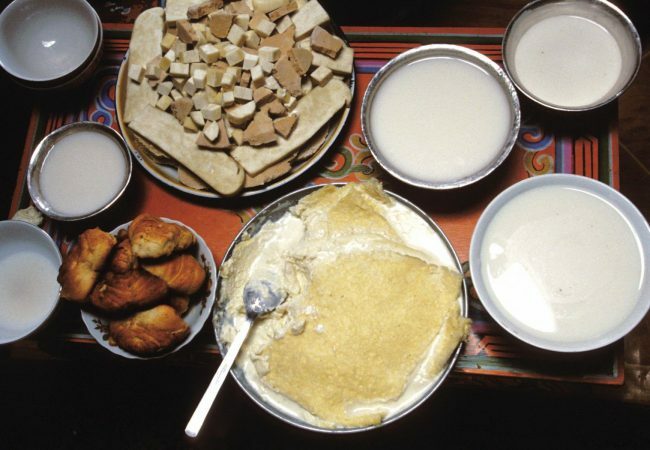 The Suutei tsai or tea with milk is the most consumed drink of Mongolia and you will be proposed some each time you’ll visit a Mongolian family. Once in the yurt, it’s the first thing you’ll be proposed, and you’ll have to accept the cup with your right hand (in the same way as for airag) and put it to your mouth before putting it on the table. The tea with milk is made with cow milk mixed with water and black tea leaves. It’s lightly salted and sometimes serves as base for a soup, for example banshtai tsai, tea with raviolis inside.